In this post, we will see how we can get rid of the error “Briefly unavailable for scheduled maintenance. Check back in a minute,” in WordPress. If you are working with WordPress, or your blog or website is made in WordPress, you may face this kind of issue whenever you are updating any plugins or updating the WordPress core. But sometimes, what happens is that even after the update process is finished, your site remains in maintenance mode. Here, I am going to share with you a quick fix, so that you can fix this issue. I hope you will like this. So, I thought of sharing a quick fix with you for the same. Here are the steps to remove the error," Briefly unavailable for scheduled maintenance. Check back in a minute". You can either go to your ftp folder via file explorer or by using an ftp client, like FileZilla. Check for the .maintenance file in the root folder and delete it. Now, if you refresh your WordPress site, it will be running fine. Hope it helps. Did I miss anything that you may think is needed? Did you find this post useful? I hope you liked this article. Please share your valuable suggestions and feedback with me. A blog isn’t a blog without comments. So, comment on it but try to stay on topic. If you have a question unrelated to this post, you’re better off posting it on C# Corner, Code Project, Stack Overflow, Asp.Net Forum instead of commenting here. Tweet or email me a link to your question there and I’ll definitely try to help if I can. Let's say there are 2 servers, server 1 and server 2 and server 2 has high configuration.With this algorithm Load balancer will allocate more requests to server 2 to utilize it better. Like Least Connection this also allocates request to the server withthe least number of active connections but the higher configuration server will handle more requests based on the right proportion defined during the Load Balancer setup. Weight proportion is calculated by the server capacity. Server 1 : Capacity X, Server 2 : Capacity : 10X the weight for each server would be 1:10 . Round Robin is a vastly used and simple algorithm. Load Balancer distributes requests in the cyclic order irrespective of server inefficiencies. There might be the scenario if you don't want to overload any of the servers for some reason, you may use this algorithm to give extra weight to other servers. Both the Servers are ready to take request, suppose request comes and load-balancer routes to Server 1 then if a second request comes it will be routed to Server 2. The third and fourth will be routed to Server 1 and 2 respectively in a cyclic order. Even if one of the server has stronger configuration i.e. RAM, CPU etc. As per Round Robin algorithm Load-Balancer will follow the cyclic order. On the other hand Layer 7 Load Balancing decides routing on the basis of OSI Layers 5, 6, and 7 which together makes Http. European IIS 10 Hosting - HostForLIFE.eu :: How To Fix "Unrecognized attribute targetFramework" Error? 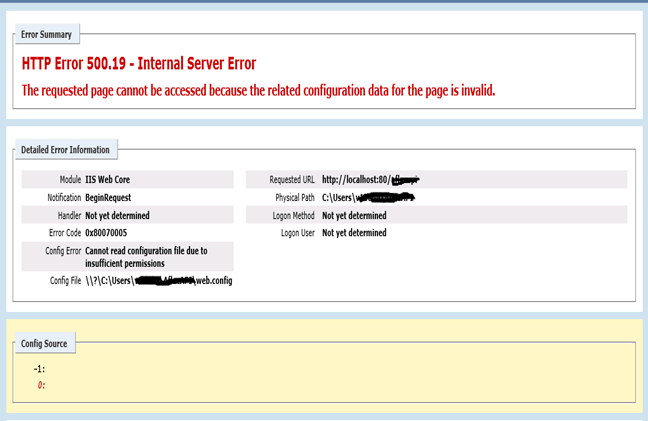 We may get the following error after publishing a website on IIS. "Unrecognized attribute 'targetFramework'. Note that attribute names are case-sensitive." To fix it, we need to follow the below troubleshooting steps. Check on which .NET version the application is developed. Let's assume, it's .NET 4.0. Open IIS Manager and find the Application Pool, on which your website is hosted. Go to that Application Pool and check the .NET version and change it to 4.0 accordingly by clicking on Basic\Advanced Settings. If .NET 4.0 is not listed, go ahead and install it. It should show up as .NET 4.0 in the .NET Framework Version dropdown for the application pool. Here, we are going to connect with the Docker engine remotely using PowerShell. For this, we can either use our local machine or a VM. Before we proceed further, make sure that your Nano Server is up and running. Create a variable that references the zip file which is in the official docker website. This zip file will have the Docker engine data that is required to create the client and server. Open the PowerShell with administrator privileges and run the below given command. The next step is to invoke a web request to get the link that has been referenced in the variable called. Then, the file will be stored in a temporary storage by getting downloaded from the Docker site. For this, we have to run the following command. Now, we have finished installing the Docker (client) and Dcokerd (engine) in "Program Files" folder. Check for these inside the Docker folder. Here, Docker is client and Dockerd is engine. Now, we are going to configure an environment variable that will store the DNS name of our Nano Server and connect with it. For this, run the below command. Note - Replace the DNS name with your Nano Server DNS or IP. Now, open the new PowerShell console and run the command "docker version" . This will show you the client (Docker) and engine (Dockerd). This means we have created a connection in between these two services which we have actually downloaded from the Docker website. In this article, we will learn the most useful and powerful command line tool, AppCmd, for publishing or hosting a website on IIS. Using the AppCmd tool, we can host static as well as a dynamic website (ASP.NET Webform, MVC, Dot Net Core etc) easily. I assume you are aware of (or have knowledge of) how to Host or Publish Website in IIS using inetmgr. This will help you understand AppCmd.exe. AppCmd.exe is the command line tool for managing IIS 7 and above. It provides an easy way to manage a website without Graphical User Interface. The AppCmd.exe command line is built on top of a set of top-level server management objects, such as Site and Application. These objects expose methods that can be used to perform various actions on those objects, and object instances expose properties that can be inspected and manipulated. AppCmd.exe is located in the %systemroot%\system32\inetsrv\ directory. Because it is not a path of the PATH automatically, you need to use the full path to the executable when executing commands like in %systemroot%\system32\inetsrv\AppCmd.exe list sites. Alternatively, you can manually add the inetsrv directory to the path on your machine so that you can access AppCmd.exe directly from any location. Run Command Prompt as Administrator to using AppCmd. In this article, we learn basic command to host websites. From the above screenshot, it is clear that Command Prompt is run as administrator and run AppCmd which return list of supported Command. List all hosted or published websites in IIS. In the above screenshot, I have run List Site command which returns all published site with bindings and state of site e.g. Started or Stop. For any website hosting we require information as above like Site Name, Bindings (Protocal, hostname), Physical Path, Credential for access or permission to folder path. Sometimes, if you don't provide access/permission to a physical path then you might be getting Access denied error. Hope you enjoyed this and learned a new way to host or publish a website using AppCmd. European IIS 10 Hosting - HostForLIFE.eu :: How to Fixing Common Errors While Hosting Web API In IIS? While publishing Web API using Visual Studio, you may run into some errors. This article helps to provide the solution to the possible errors that will occur. When you publish the Web API from Visual Studio, the following error may possibly come up. OutputPath property is not set for project 'Company.Directory.Web.csproj'. Please check to make sure that you have specified a valid combination of Configuration and Platform for this project. Configuration=Release Platform='AnyCPU'. You may be seeing this message because you are trying to build a project without a solution file, and have specified a non-default Configuration or Platform that doesn't exist for this project. When you try to publish for the first time, one of the reasons for the above error to pop up is due to the incorrect settings in .csproj.user file of the solution. Open the .csproj.user file in the solution and change the settings in the file. Add the following code in the file. The above error will pop up when you do not have the permission to access the folder/web.config file. In Windows Explorer, locate the web.config file that is associated with the Web site. In the Enter the object names to select box, IUSR, click Check Names, and then click OK. In the Web.config Properties dialog box, click OK.
One of the reasons for the error 500.21 Internal Server Error to pop up, is when ASP.NET is not installed completely in your system. Type the line in the command prompt below any one. Create the application pool in IIS by selecting the .NET version which your project supports. When creating the site in the default application in IIS for Web API, select the application pool which you have created. The above error will pop up if the application pool which you have created has a built in account selected. For reference - go to: "Advanced Setting->Process->Identity” of the application pool which you have created. Change the application pool identity to custom account and click on set button to provide the account credentials. 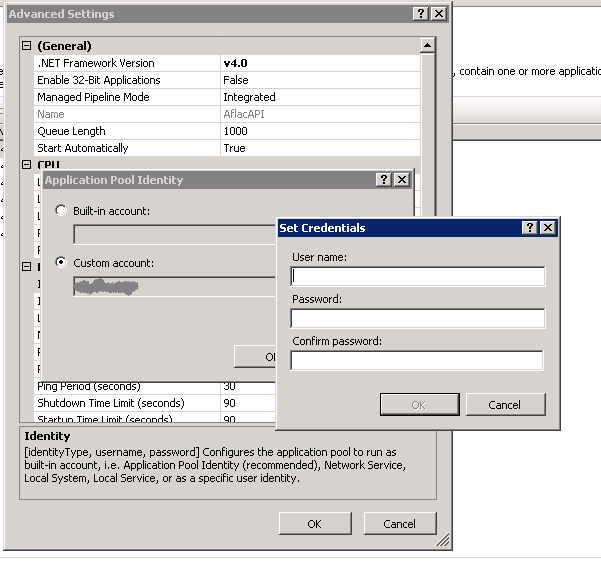 Once you have set the setting, refresh/reset IIS to resolve the above error. The above error will pop up if the solution directory (folder) doesn’t have required permissions. 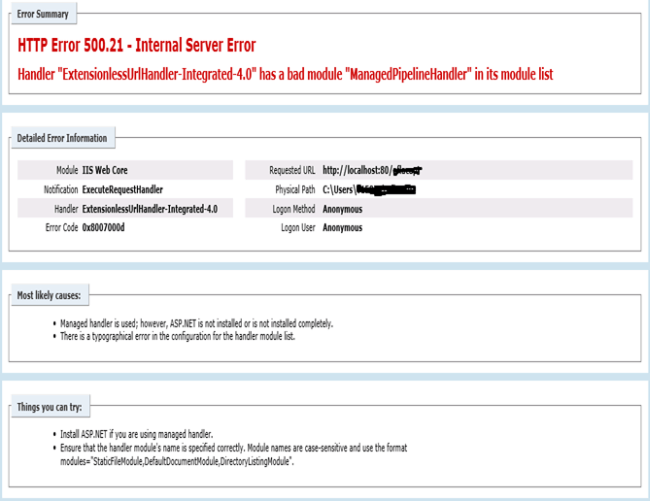 To resolve the issue follow the steps given in “500.19 : internal server error”. One of our clients receive this error message when deploying his ASP.NET application. “System.Net.WebException: The underlying connection was closed: Could not establish trust relationship for the SSL/TLS secure channel.”. Here is how we solved that issue. A Server Name Indication (SNI) certificate basically means that you can install oneSSL/TLS certificate on a web server, to use on multiple domain names. The TLS part takes the negotiation, and that enables the server to select the correct virtual domain early and present the browser with the certificate containing the correct name. Therefore with clients and servers that support SNI, a single IP address can be used to serve a group of domain names for which it is impractical to get a common certificate. Windows Server 2003 (IIS 6.0), Windows Server 2008 (IIS 7.0) and Windows Server 2008 R2 (IIS 7.5) do not support SNI-certificates. You might wonder what the solution to this error message was. Well, simple: Move the website to an IIS 8.0+ (Windows Server 2012) web server. This version supports Server Name Indication certificates. Microsoft calls this SSL Scalability in IIS 8.0. Because of SNI, or SSL-scalability, support in Windows Server 2012, the ASP.NET System.Net.WebException went away.